I'm getting into the spring mode today...luckily, so is the weather!....well at least until Sunday when its going to snow and rain and ruin all my tulips that are popping up. But, with this tinge of spring fever I've got, I'm totally loving all the grass projects, flower projects and yes......even moss projects! 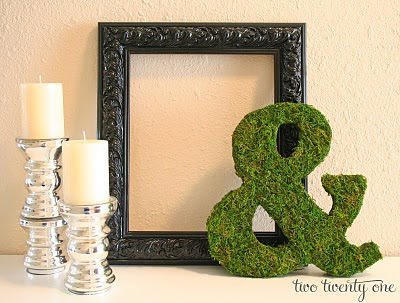 She has a great tutorial on how to even make the ampersand (yes, projector included) all the way to covering that baby up with moss. See her great tutorial here! Thanks Chelsea for the great inspiration! I meet your blog by a friend anonimous, i'm reading for a few days and love all your works. So great! Your bedroom is fabulous, but also the previous decor are. Also liked the bookcase near the fireplace. Keep going whit good works, and thanks for share! looove the ampersand! looks great! !